In 1972, Life Cereal’s TV spot premiered with a skeptical but fearless 3-year-old named Mikey, who was asked to sample a new cereal that his older brothers were offered at breakfast. They demurred, noting it was “supposed to be good for you” and offered it to their youngest sibling, who they were assured, “won’t eat it—he hates everything.” No risk, no reward, as they say, and the rest is history. 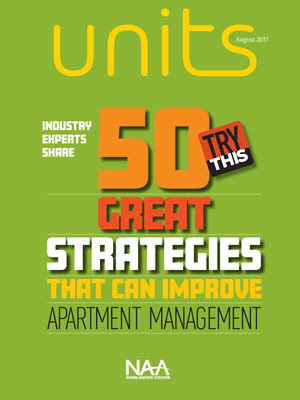 In this month’s units Magazine, we encourage readers to try more than 50 apartment operations tips and strategies provided by industry experts during the 2017 NAA Education Conference & Exposition. In the appropriately titled, “Try This,” you may find a few things that even little Mikey would like.